We will be installing WordPress next week and you will need a place to put it. You can use your Zephir account with Seattle Central, which sometimes takes 10 days or so to become active (due to fee payment processing)--or if you have your own hosting like Dreamhost, that will work too. If your student server space is not active by next Tuesday, let me know. You are not required to get external hosting--although, I recommend it as your student account doesn't last forever. Once you have your web domain and hosting, email me a link to your website. WordPress.com is like blogger. 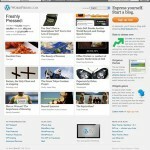 It's a blogging site where you can setup a personal WordPress blog without hosting it yourself. WordPress.org is where you can download the WordPress software, which is the version of WordPress we will be using for this class. 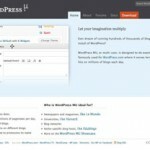 WordPressMu is the massive multi-user WordPress app. WordPress.com runs on WordPressMu. If you need to setup a site with a growing number of users who each need their own admin interface to WordPress, WordPressMu is your app. Scaling to tens of millions of pageviews per day. Different permissions on different blogs. WordPress works like many other content management systems with the caveat that it assumes your site will use RSS, commenting, archiving and an interface geared toward blogging. This model can be completely overridden or ignored if you find it's not what you want. My view of the CMS world is from the perspective of a freelance web developer who makes sites for small businesses (1-10 employees) who want to administer their own sites. These users are, typically, highly non-tech savvy and eager to get their sites running quickly and cheaply. CMSMatrix has a great tool for comparing every CMS you can find with just about every concern you may have. An article by Web Helper Magazine compares the three using CMSMatrix data and popularity reports. Drupal has a great architecture but doesn't have enough variety in themes and extensions. Customizations come at high dev cost. Drupal is fast but the learning curve is too high for most of my clients (small businesses and freelance workers). Joomla is so feature rich that it's much slower than Drupal and ends up being a bit bogged down. The learning curve for Joomla is also too high for most non-tech savvy business owners to manage their own sites. Both Joomla and Drupal have a fairly large up-front learning curve whereas WordPress can be easily administered and setup by fairly tech-illiterate people. WordPress also has a massive set of user extensions and themes to build on top of, it's easily upgraded and maintained and it's fast (as long as you don't bog it down). Usually with a 1 hour sit down, I can give my clients all they need to know to add/remove/update content on their WordPress driven website. WordPress is so easy, my mom can use it.